On New Year’s Day Kansas state parks wants to help you get some exercise and experience some of Kansas’ finest hiking trails. The event, called First Day Hikes, will be held at 19 Kansas State Parks. 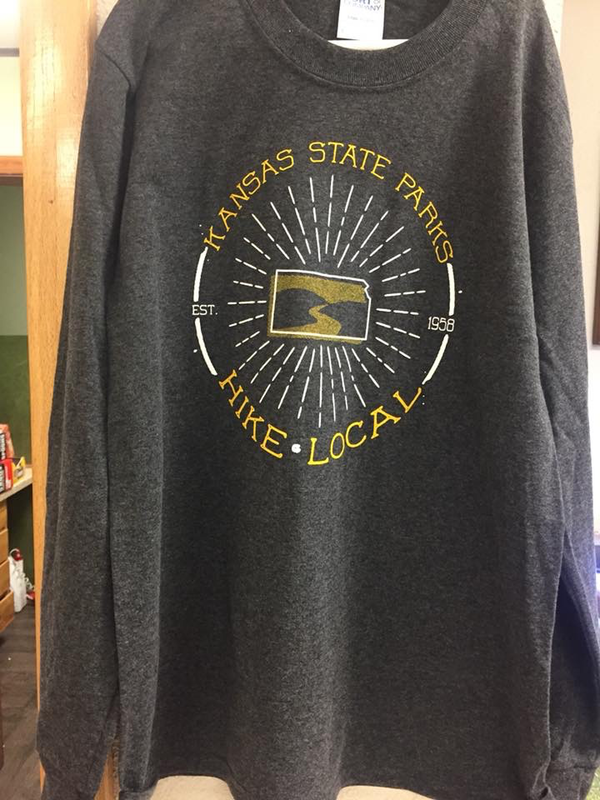 All hikers get a free, “Hike Local” long-sleeved t-shirt. Kansas’ 26 state parks offer access to over 1,000 miles of Kansas hiking, cycling and horseback trails, ranging from short, paved paths to the 96-mile Flint Hills trails. First Day Hike trails are generally a mile or two of family-friendly terrain. Park staff lead the treks to help to educate hikers along the way. Many hikes will be along the shores of large lakes, pass through tall, rugged woodlands and/or across broad native prairies. Odds of seeing things like bald eagles and other wildlife are very high, so bring your binoculars. First Day Hikes began in Massachusetts about 25 years ago. All states, including Kansas, came on board in 2012. Many are held in Canada, too. Most Kansas state parks hosting hikers will offer drinks and snacks. Hikers are also encouraged to bring their own, too. Leashed pets are welcome. Children must have adult supervision. The guided hikes are free. Participants need a vehicle permit to drive into the park. Daily passes are $5 and sold at self-serve stations in the park. Some park offices will be open to sell daily passes or $25 annual passes. People are encouraged to buy the 12-month Park Passport state park permit when they register their vehicles. State park Facebook pages will carry the news if hikes are cancelled because of bad weather. Cheney State Park – Meet at the park office for the 2 p.m., ¾-mile West Side Nature Trail hike. Easy to moderate terrain. All ages welcome. Clinton State Park – Meet at the park office for the I p.m. hike on the North Shore Trail. Hike up to two miles, moderate terrain for kids five and up. Crawford State Park – Meet at the beach shelter house for the 10 a.m. to hike the two-mile Spider Leg Bridge Trail. All ages. Moderate terrain. Cross Timbers State Park – Meet at the Chautauqua Hills Trail trailhead for the 2 p.m., 1 ½-mile hike. Easy to moderate terrain. All ages welcome. El Dorado State Park – Meet at the Walnut River Cabins for 1 p.m., two-mile Walnut River Trail hike. All ages. Easy to moderate terrain. Elk City State Park – Meet at the trail head for the 8 a.m. Green Thumb Trail hike. Three miles. Moderate terrain. All ages welcome. Fall River State Park – Meet at the Quarry Bay maintenance shop for the 2 p.m. hike on the ¾ mile Post Oak Trail. Moderate terrain. All ages. Flint Hills Trail State Park – Meet at the old depot in Ottawa for the 2 p.m hike. Two-miles of easy terrain. All ages. Glen Elder State Park – Meet at the historic church for the 9 a.m. hike on the four-mile Waconda Trail. Easy terrain. All ages. Hillsdale State Park – Meet at the park office for the 10:30 a.m. hike on the Hidden Springs Nature Trail. Easy terrain of 1.5 miles. Ages six and up. Kanopolis State Park – Meet at the park office for the 10 a.m. hike on the Split Boulder Trail. Easy terrain, 1.6 miles. All ages. Meade State Park – Meet at the park office for the 2 p.m. Eagle Trail hike. Easy terrain. All ages welcome on the 1 ¼-mile trek. Milford State Park – Meet at the group shelter parking lot for 1 p.m. hike on the Eagle Ridge Trail. Easy to moderate terrain. All ages welcome on the 2 ¾-mile trek. Perry State Park – Meet at the Lake View parking lot for the 10 a.m. hike on the 2 ½-mile Nature Trail. Easy to moderate terrain. Youth 8 and older. Pomona State Park – Meet at the park office for the 2 p.m. 1.5-mile hike around several campgrounds. Easy to moderate terrain. All ages. Prairie Dog (Norton) State Park – Meet at the Nature Trail parking lot for the 9 a.m. hike. Easy terrain on the 1 ¼-mile hike. All ages. Sand Hills State Park – Meet at the park office/cabin for the 10 a.m. hike on the Dune and Prairie trails. One mile of easy to moderate terrain. Tuttle Creek State Park – Meet at the park office for the 10:30 a.m. hike on the Western Heritage Trail. Easy terrain for a hike that varies from one to 3 ½ miles. All ages welcome. Wilson State Park – Meet at the Cedar Trail parking lot for the 1 p.m. hike on the trail. Easy terrain.